Poland suffered terribly in World War II. The War began in Poland on September 1st, 1939 with the simultaneous German invasions of Gdańsk and Warsaw. By early October, Polish resistance was eliminated. Shortly thereafter, the Soviet Union moved into eastern Poland and the country was partitioned between the two powers. On the Soviet side, millions of Poles were sent to Siberia and on the German side Polish Jews (there were originally three million) were rounded up into ghettos or sent to concentration camps. In Warsaw alone 800,000 Poles died as a result of the terrors of World War II, more than double the entire number of U.S. casualties. Although much of Warsaw was rebuilt after the War, there are remnants of this dark period left for the tourist to explore. 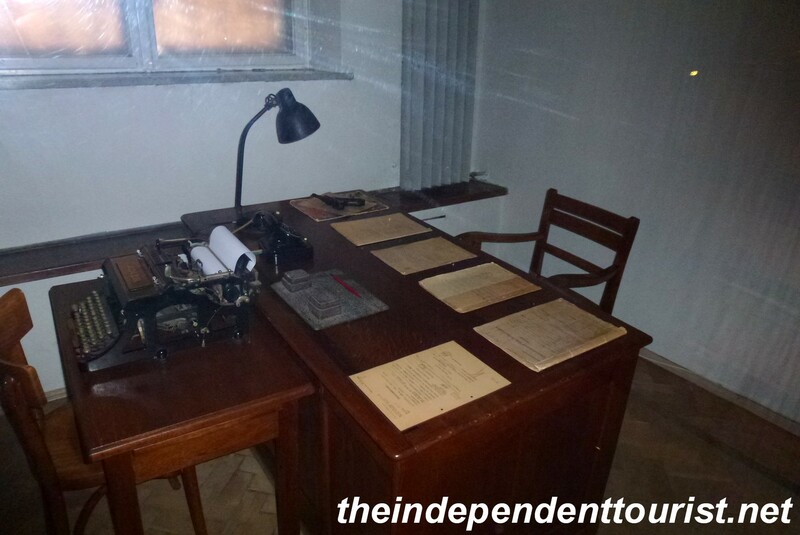 In this building, the feared secret state police of Nazi Germany (“The Gestapo”) tortured and interrogated thousands of Poles who were accused of crimes against the Nazi state or suspected of having valuable information. A street view of The Mausoleum of Struggle & Martyrdom. This museum is free. The tortures were many and varied, they included being beaten with a variety of instruments, or being hung upside down with water pumped into the nose, the use of electric shocks, being burnt with irons, and sometimes being forced to watch while a family member was tortured. 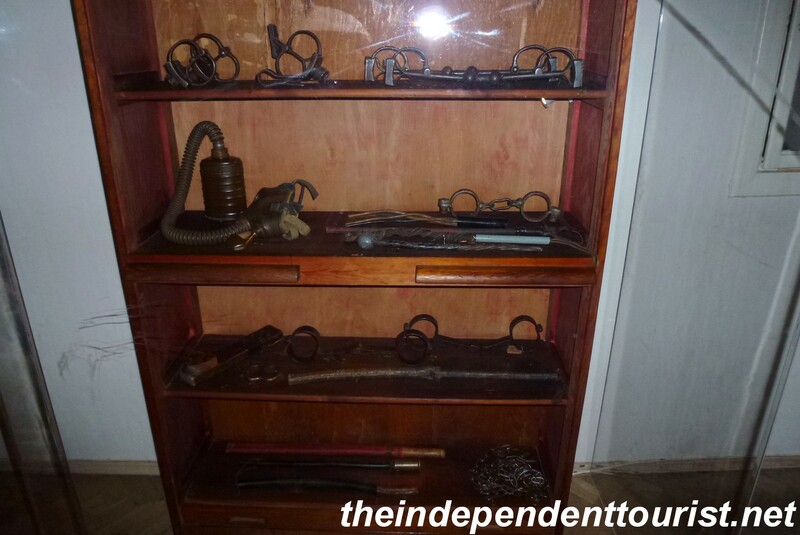 A display of various interrogation/torture devices. The rooms are well sign-posted in English and when you realize you are in the exact spot where so many innocent people suffered, it is a moving experience. Cell doors in the museum. 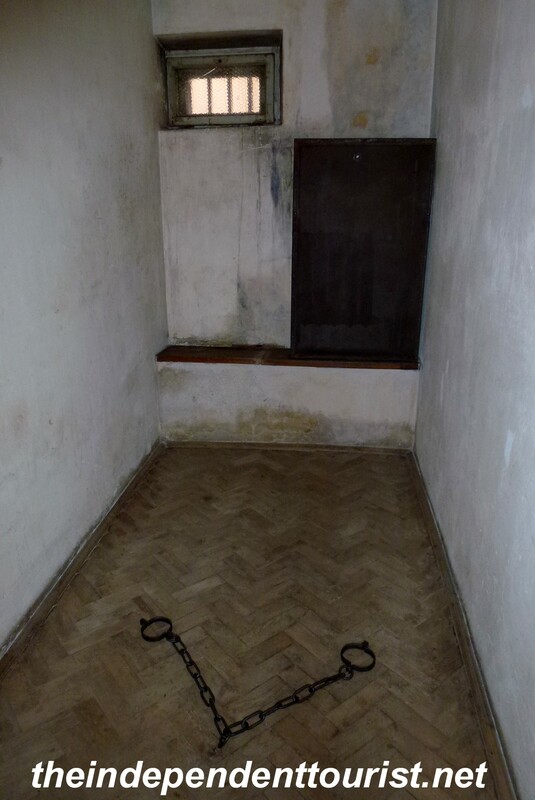 Prisoners were kept in cells like this (and chained as shown) and sometimes interrogated for weeks or months–often with little food, sometimes ill, often beaten and without a bed. 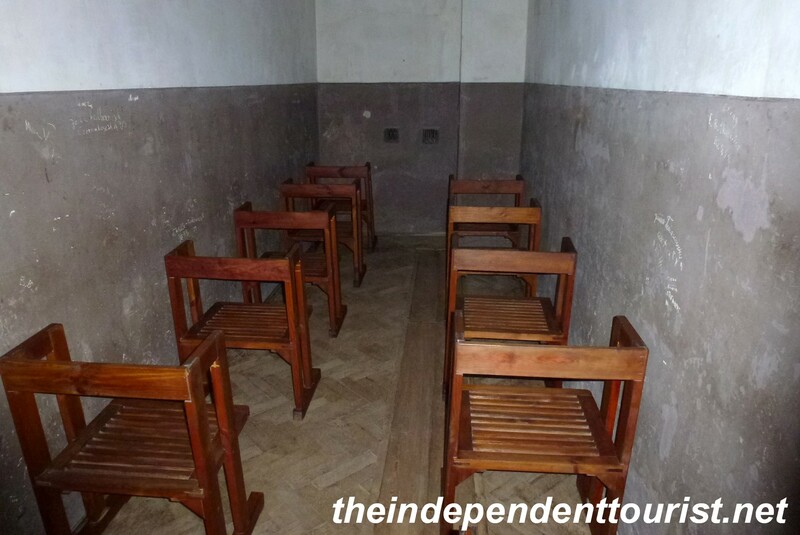 Prisoners would wait in these chairs for questioning, sometimes for days. They were not allowed to fall asleep, talk or move. If you violated the rules you might be beaten to death. As a way of controlling the Jewish population, in 1940 the Germans built a ghetto compound in Warsaw by erecting walls with barbed wire down the middle of streets. A portion of the Warsaw Ghetto wall. 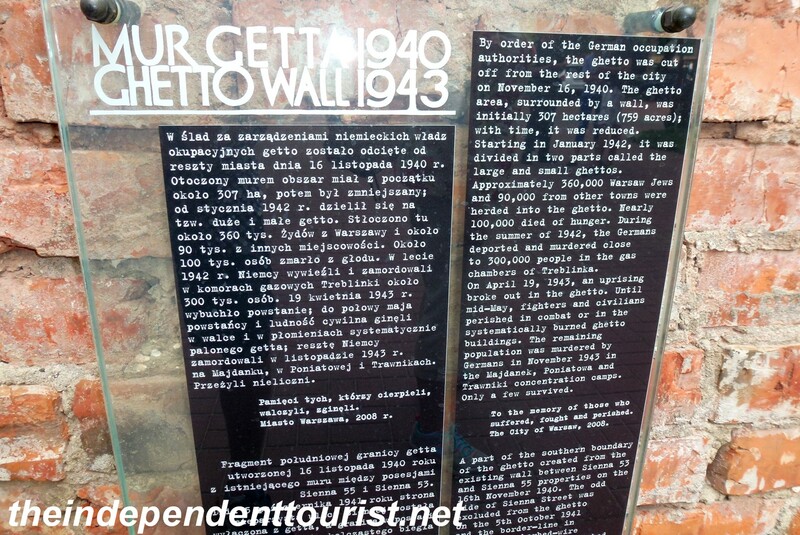 Information about the Warsaw Ghetto is posted on the wall. 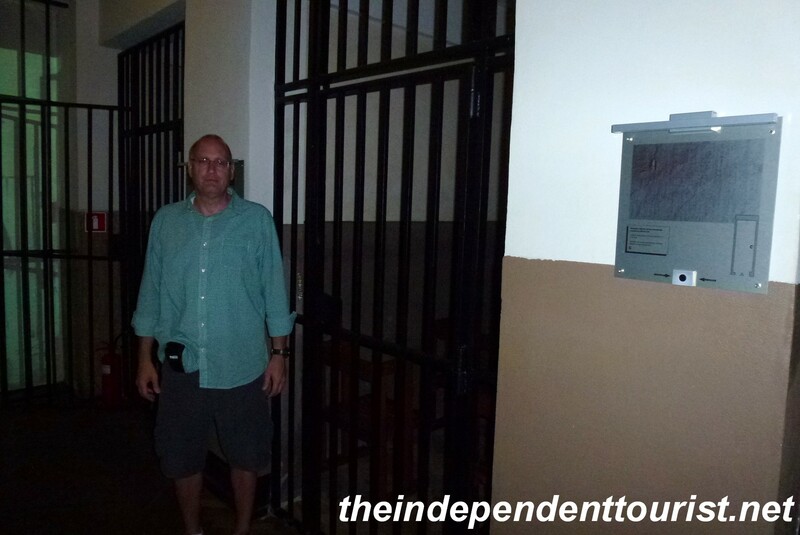 About 360,000 local Jews and 90,000 Jews from other locations were moved here. During the summer of 1942, 300,000 Jews were transported to the Treblinka death camp and gassed. The ghetto was systematically destroyed in 1943 after the remaining occupants were killed or moved to various concentration camps. Today, there is very little left to see, except for a bit of the wall with information plaques. This building is a survivor from World War II. The facade is pockmarked with bullet holes. 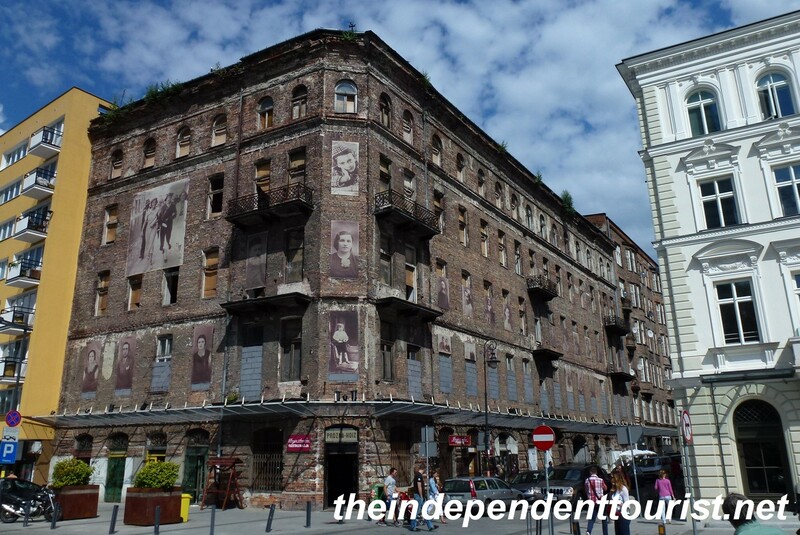 It’s located on Ul Próżna street, just a few blocks from the Ghetto wall. 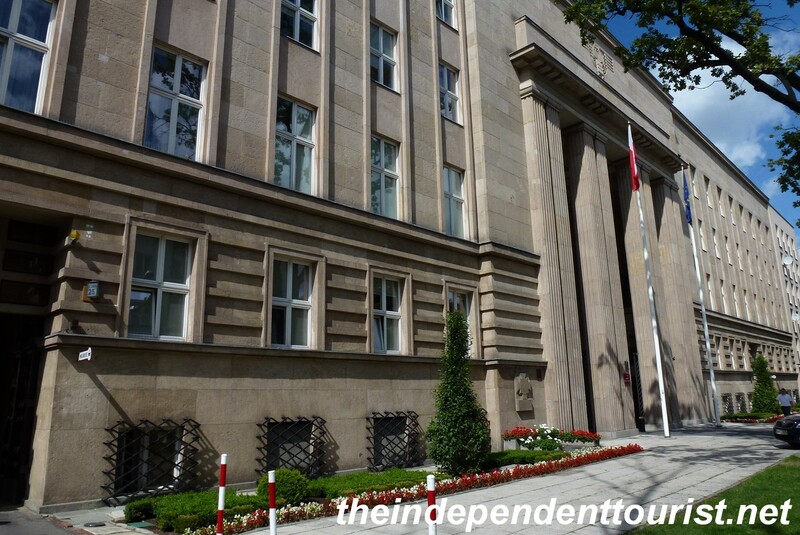 This is one of the most important landmarks in Warsaw. 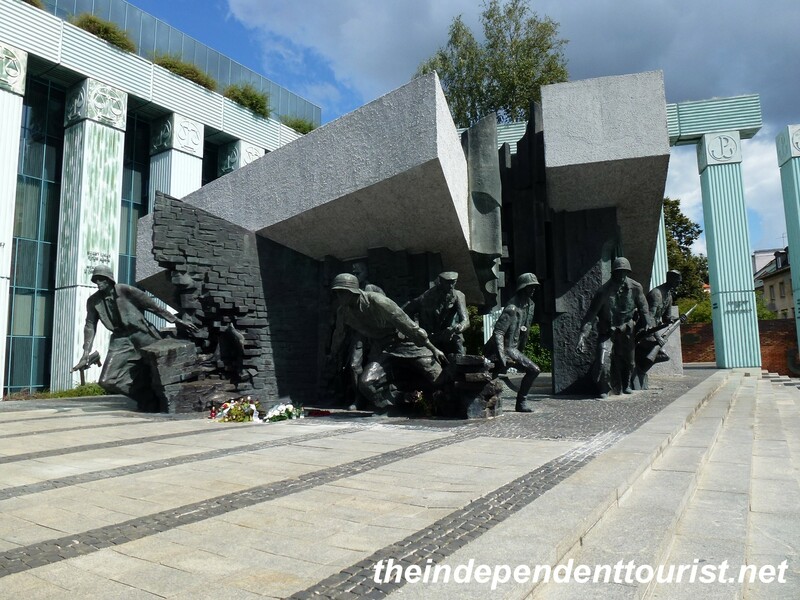 It commemorates the August 1, 1944 uprising by the Poles against the German Army, just as the Germans were losing ground to the advancing Soviet forces from the east. The Poles fought bravely for 63 days and actually were successful to start, but they were eventually overwhelmed by the Germans. Hitler destroyed the city in retribution for the uprising and about 200,000 Poles were killed. The Soviet Army could have actually helped the Poles, but Stalin told his army to stand down and let the Germans destroy the Polish resistance, to take any “fight” they had left in them, in preparation for the Soviet and communist takeover of the country early in 1945. The bronze sculpture shows the Polish fighters emerging from the brickwork of their ruined city and descending into the city sewers, which were used as an underground communications system. It was unveiled on August 1, 1989, 45 years after the uprising. While modern Warsaw is far removed from the horrors of World War II, I was glad to see the remaining bits of history, so that those of us who now visit have an opportunity to remember and honor those who gave their lives defending their country from tyranny. 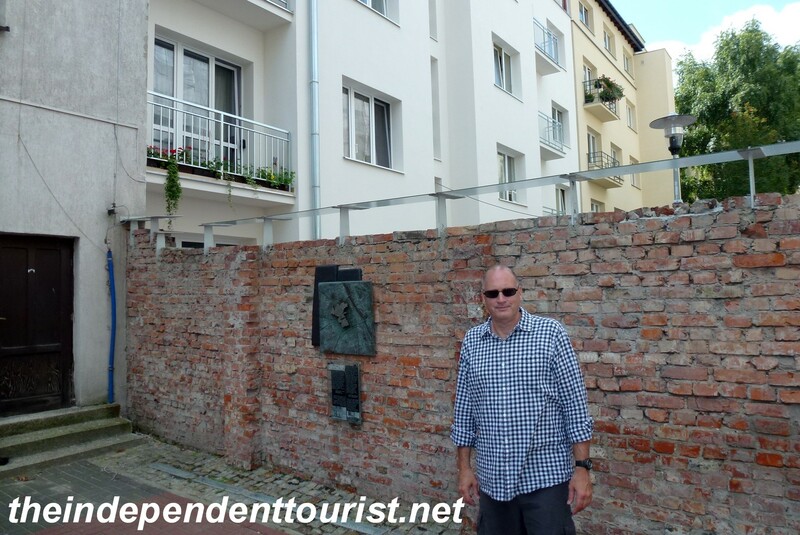 Posted in Poland and tagged Things to see in Poland, Warsaw Sights, World War II sights in Warsaw on November 30, 2014 by Paul Terry.